Man Of the Match don´t win 4% prize anymore? Thread: Man Of the Match don´t win 4% prize anymore? My MOM player didn't receive anything on the last league match. I don't know if it was the same on previous matches (didn't check). Does anyone know if this bonus ended with the last update? but another member in the Greek forum also noticed that bug. I can confirm that too. I always take a look after every match, and there is NO, nada, 4% for MotM. Alongside with that, dunno if it's a bug or it is a limit : when you are supported by more than 1 friend, you don't get extra possesion %. It remains at 15%, no matter how many ppl are supporting you. This happens no matter if you attend the match or not - 15% no matter if 10 or 100 ppl are supporting you. We will look into this. Thanks for reporting. maloukees and regtop11 like this. Today I saw it. After the match take a closer look at the player who got MotM. 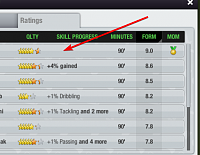 PlayerX - 4% Speed, 1% Finishing, 1% Shooting ( for example ). The 4 % Is the MotM reward. However I didn't get that bonus a week ago for my MotM, despite he was the MotM, no 4%. Yes, I won, and I saw my GK was the MotM ). He didn't get the extra 4%. He is 24 y/o 6*. Last night my AMR took the prize ( 4 1/2* ) + 4% on the window log after the match.